Collect natural light & the sun’s rays from your balcony railing ! Place a solar balcony reflector on the railing in front of your window… and immediately enjoy a lighter and brighter home every day, as well as the sun’s rays in good weather. This Solar Balcony Kit allows you to transform your classic Balcony Reflector in a Solar Balcony Reflector. Thanks to a complementary technical part to install on yout Reflector, it become possible to tilt the surface and choose how to direct the light. You will be able to do it right to left or top to down so that you can capture the sun's rays better. Placed flat under the sky, the highly reflective surface of the Espaciel Solar Balcony Reflector captures the daylight and sunlight and redirects them deep into your home. With a simple gesture, you can anglethe Espaciel Reflector to select the area of the room you wish to brighten up. 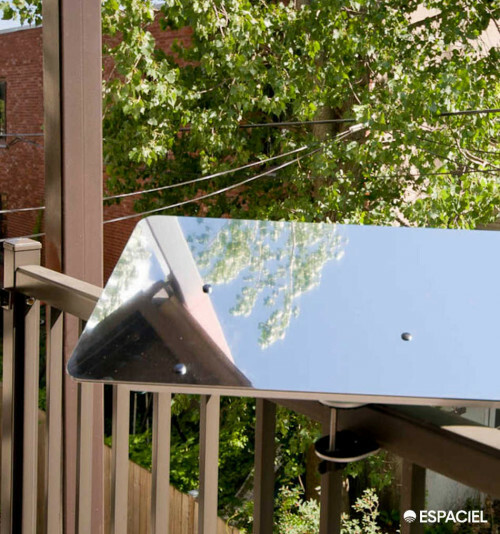 The Espaciel Solar Balcony Reflector can be installed in a matter of minutes with no drilling. It can also be installed on a flower planter or trough. Free delivery in a week.